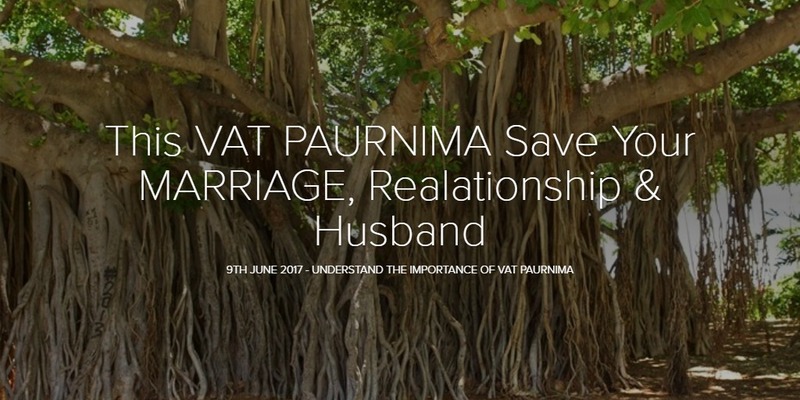 VAT Paurnima - 9th June 2017 - Great Muhurat to Save your Marriage, Relationship and Husband...! This is Not a Story, This works Like a Bulls Eye and it is a Strong Vrata and need to be done with deep Devotion towards the Supreme Lord and Love towards the Husband, the Marriage and the Marital Life. this can be broken as Sandhi Vigraha like Az + Vattha and the meaning is Ever Expanding, and really this Tree is always expanding....No One can deduce the Life of a Vat Vriksha.....It is ETERNAL, it is Divine. Ok, One important Note - This Year in 2017, the Paurnima starts from 8th June 4:17 PM and it will run till 6:30 PM on 9th of June 2017.